Edgar Cayce is perhaps one of the best known clairvoyants of the last century. While most of his psychic readings were dedicated to healing people, his readings also covered a wide range of spiritual and metaphysical topics. Click for Cayce Clips — Our short clips provide you with a quick focus on a single concept from the Edgar Cayce Readings (ECRs). Click for Cayce On — Our classes study the Edgar Cayce Readings (ECRs) by using the textbook, A Search for God, a book of affirmations and discourses based on the readings and discusses how to practically apply loving Christian aspects such as cooperation, self-knowledge, faith, virtue and patience. To view a video, simply click the title. For even larger screen viewing, just click the YouTube logo in each video. Below our our most recent videos in both categories. For even larger screen viewing, just click the YouTube logo. Edgar Cayce on Color. For even larger screen viewing, just click the YouTube logo. John Schroeder presents Edgar Cayce on Pets, Animals and Elementals . ﻿ For even larger screen viewing, just click the YouTube logo. 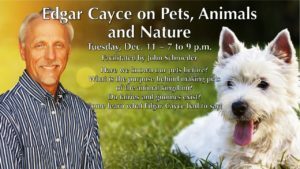 John Schroeder presents Edgar Cayce on Pets, Animals and nature . For even larger screen viewing, just click the YouTube logo. John Schroeder presents his perspective in comparing the psychic readings of Edgar Cayce with the metaphysical teachings of Eckhart Tolle.